2 1/2 x 4 Rolled Blank Scroll | Blank Scrolls | Scrolls Unlimited, Inc. 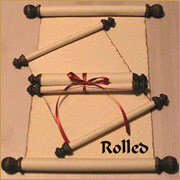 This is a perfect size scroll for you to write your own short and sweet message. Sunday School teachers love the uniqueness of these scrolls. Children love to play with them. They can write notes, sayings, verses and even make tiny treasure maps. Packages of 6 are available. Quantity discounts are available for 25 or more.